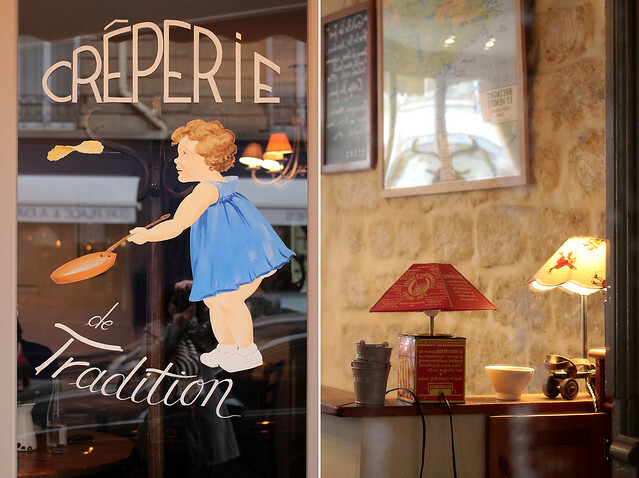 We’ve been passing by this quaint crêperie mere minutes walk away from our current place on a number of occasion, always busy, so we gave it a go recently when the craving for galette and crêpe hit. I ordered my favourite combination for the galette: andouille, cheese, caramelised apples and sunny side up-like egg. F has a flambéed creation with scallops and cream. Sweet crêpe was easy to decide too, as we both adore salted caramel. 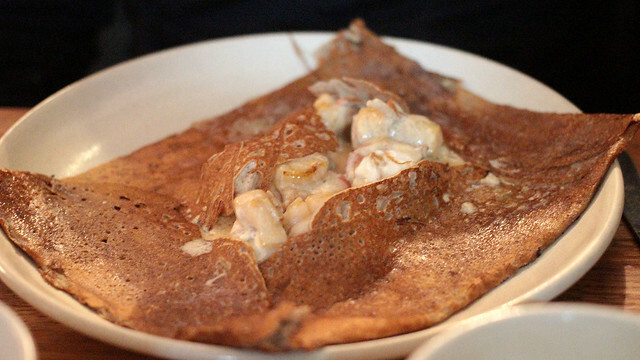 I enjoyed my galette with its crunchy, lacy wrap around the rest of the ingredients. The portions of cheese and caramelised apple were generous – I wish there was more of the andouille. 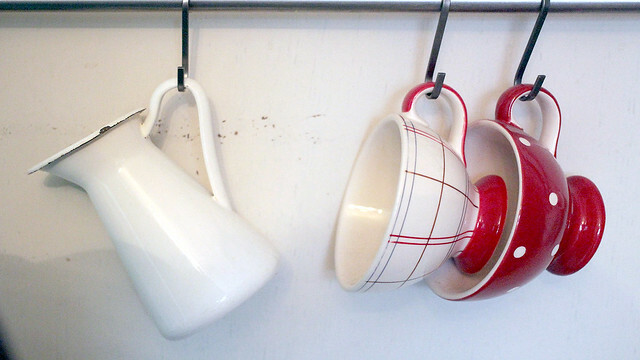 It is a particular ingredient, which people either love or hate, and I happen to love it. The flambée rendered F’s galette soggy, thus lacking texture that we were looking for. 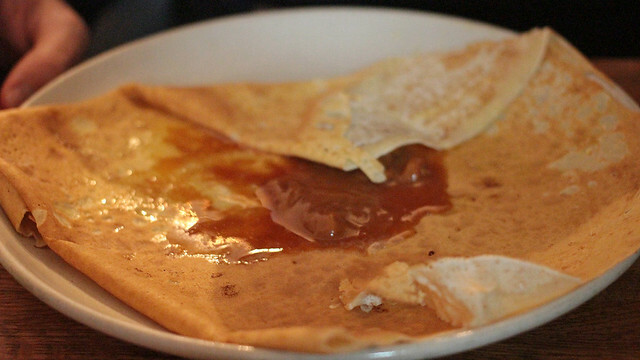 The salted caramel crêpes were a very welcomed cap to the meal, which we washed down with a pitcher of cider. Clearly, there was a mix reaction to our lunch. 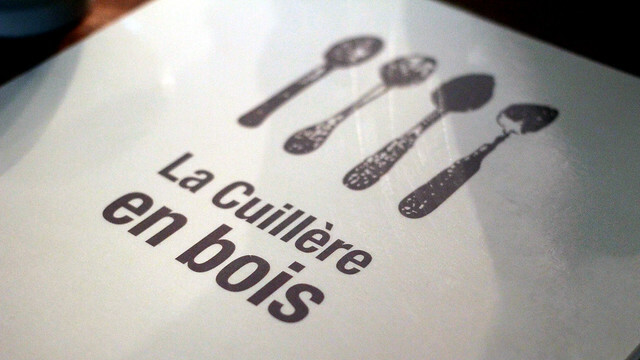 F was less impressed than I was, but we both agreed that La Cuillière en Bois merits another try sometime soon. If we could get consistently toothsome galettes and crêpes, we will establish this joint as our regular go-to crêperie. Goodness knows how tricky it can be to find a good one, never mind one within walking distance too. A bit different than roti though; not the same kind of texture nor taste. You should just come here so I can feed you some!